The OPEN programme provides funding for a limited number of high quality research projects in areas that are currently not covered by the FNR’s thematic CORE programme. It aims at supporting established researchers to pursue innovative research projects of high scientific quality in emerging research areas in Luxembourg. OPEN is restricted to experienced researchers with a proven track record in their respective field. OPEN projects have a lifespan of 2 – 3 years. 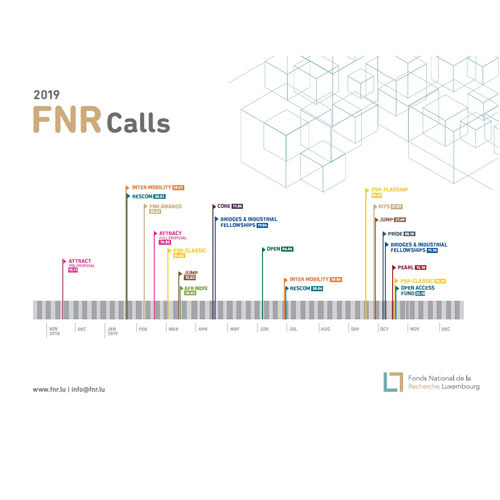 The FNR allocates a maximum financial contribution of 1.3 MEUR for the OPEN 2019 Call which should allow to fund up to two projects. Co-funding of a minimum of 25% of the total project costs (all partners included) by the contracting research institution is required. The 2019 OPEN Call was launched on 13 December 2018. The deadline is Thursday, 6 June 2019. Funding results of the 2019 Call will be communicated by mid-October 2019. Applicants should be aware that if the proposal falls within the thematic remit of CORE, the proposal will be rejected.